Online ticket sales has been Closed. Tickets will be sold at the venue too, we will be glad to see you there. Please participate and help us in our efforts to share the culture and heritage of India. * Click "Add to Cart" Garba Ticket, which will add one ticket, you have to update the quantity on the payment page for additional tickets. * This PayPal payment page is secure and data is encrypted. 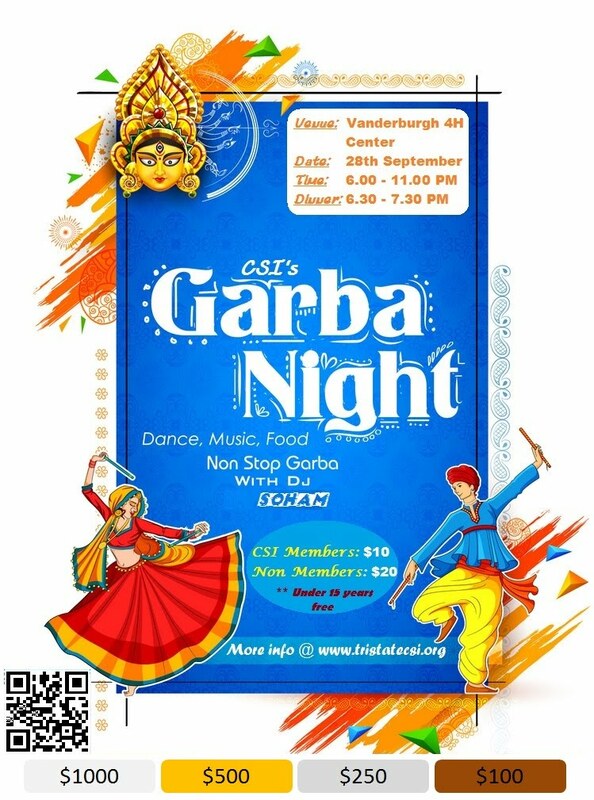 * If you are a member for 2017-2018, then choose membership price for Garba Admission Tickets, otherwise you have to choose Non-Membership price for Garba Admission Tickets. *Tickets will be provided to you at the Venue and will not be sent via email. *Contact tristatecsi@gmail.com if you have any questions.